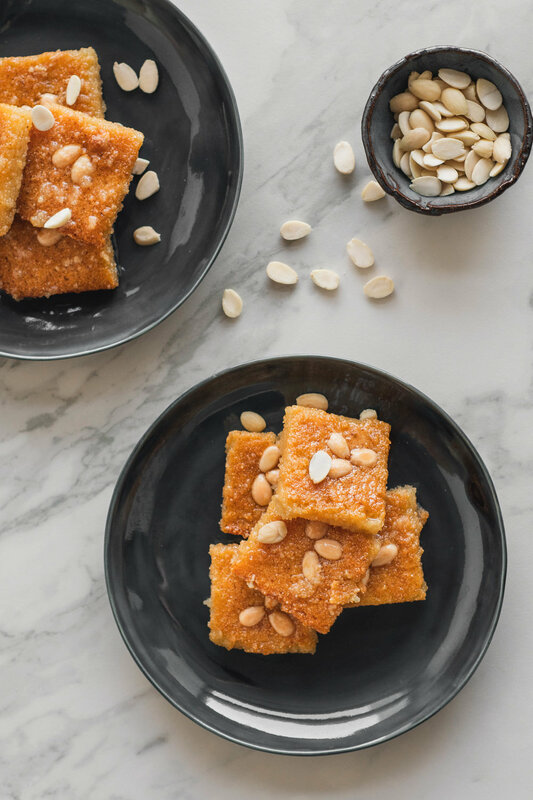 Namoura, or h’reseh with some people, is a syrup-soaked semolina cake that can be found all over Syria, from shabby corner stores to specialized bakeries. The reason is because the ingredients are quite inexpensive, and it’s a simple dessert to make. Namoura is one of my mom’s specialties, and it’s almost always on her menu when hosting or catering for others. This delectable sweet tends to vary in some ways. While some people make it more cake-like and dry, my mother’s is dense and moist. Coarse semolina (or farina) is combined with yogurt, yeast, orange blossom water and sugar and left to rest for a couple of hours. They are then baked together for about 40 minutes. Melted butter is spread over the top for the last 10 minutes to achieve a deep golden-brown. The cake is then soaked overnight in a simple syrup of orange blossom and rose water. This sweet can keep in the fridge for about a week and even longer in the freezer, for whenever you’re in the mood for a yummy treat! Start by preparing a baking sheet by spreading the tahini evenly, as if you were greasing a pan for cake. Combine the semolina, sugar, yogurt, yeast and orange blossom water in a large mixing bowl and stir with a spatula until combined. Pour the batter onto the cookie sheet and spread evenly. Imagining as if you were going to make even squares (because you’re going to later), create designs with the almonds in the center of each imagined piece. I put 3 almond halves. Rest for 2 hours. Combine all the ingredients in a medium-sized saucepan on high heat. Stir constantly until the sugar dissolves and the liquid starts boiling. Reduce to medium-low and let simmer for 5 minutes. Remove from heat. Move your shelf in the oven to the lower third and preheat at 350 f.
Bake until the cake starts to turn light gold and becomes firm, about 30 minutes, rotating the pan halfway through. Meanwhile melt the butter over medium heat. Take the cake out of the oven and brush the melted butter over the top, put back in the oven for another 10 minutes, or until the cake turns dark gold at the top. Pour all of the syrup over the cake and rest overnight. Pour off any extra syrup that the cake didn’t absorb. Cut your delicious squares and store in an airtight container at room temperature up to 2 days. The cake is EVEN BETTER the next day, but feel free to dig in! Enjoy for about 2 weeks when stored in the fridge.